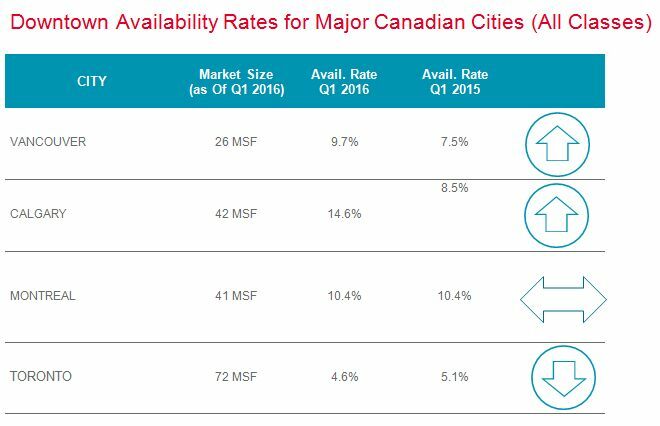 TORONTO, ON--(Marketwired - March 31, 2016) - Even with another million square foot (msf) office tower coming to market in the first quarter of 2016, vacancy refuses to budge in downtown Toronto, and remains at a two-year record-low 4.6%, where it's now sat for the past three quarters, according to Cushman & Wakefield's Q1-2016 stats released today. Tight vacancy and remarkable expansionary momentum underscores the continuing powerful attraction of the downtown market as a place for a diverse range of businesses to locate and grow. This in turn has sustained a transformative development cycle that began in 2009 and seven years later shows no signs of letting up. Canada's largest office market continues to blaze trails, far exceeding the performance of other central markets, including Vancouver. What gives? "This is a feel good story that just keeps on giving," said Stuart Barron, National Director of Research, Canadian Markets, Cushman & Wakefield. "At different points since 2009, we've predicted higher vacancy against increasing supply, but those concerns have simply failed to materialize. Vacancy remains at a low-water mark -- and we're seeing strong interest across the board for new and older buildings from tenants of all sizes." As central Canada gains economic traction due to increasing U.S. demand, the low-dollar value and the sustained low-interest-rate environment, Barron says the conditions "look good" for further growth. "Even though we're seeing explosive growth, there are reasons to be cautious. As tenants move into the new towers, we're about to see 1.2 msf of space return to market over the next couple of quarters, and that should put upward pressure on vacancy. In addition, weaker global conditions could slow growth in downtown Toronto. However, there is still tremendous expansionary momentum in the marketplace coming from a number of sectors including financial services and technology and they should continue to drive growth well into 2016," explained Barron. So what does that mean for tenants currently looking for space in a tight downtown market? "While the market is tight right now, concern over future space returning to market will drive opportunities for tenants through 2016," said Barron. Has downtown growth been at the expense of the suburban office markets? Barron says, "Bit of yes, bit of no. No question that the suburbs have paid a price through tenant migration into the downtown market. But some suburbs have been hit much harder than others. The GTA West market has seen very little impact from relocating tenants, while the East and Midtown markets have been much harder hit. It's interesting, however, that most of the first quarter growth came from existing downtown tenants." In terms of expansionary momentum, Cushman & Wakefield stats reveal a much different story in the suburban markets. Weak growth and a moderate steady flow of new supply, particularly in the west has pushed up vacancy. The GTA West saw vacancy rise to 14.1% in the first quarter from 13.0% last quarter and absorption was negative 125,000 sq. ft. Likewise, occupancy in the GTA East fell as vacancy rose to 10.3% from 9.5% last quarter. Consolidations due to merger and acquisition activity has been one of the driving forces behind space contractions and rising vacancy. The flight to quality to new Class A buildings has also driven demand for premium product.